This mens Black Peak Lapel Dress Suit is 100% wool .Look stylish in this mens black 100% wool dinner suit. 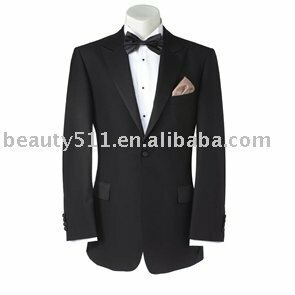 The dinner jacket has a 2 button fastening and has a contrast gold lining with a peak lapel collar. The mens evening trousers are lined to the knee and have a zip fly. Our suits are tailored to give you all the confidence you need when you make that entrance at a party or special occasion.